On paper, it was a tight come-from-behind win in Game 4 for the New Jersey Devils. After Philadelphia jumped out to a quick 2-0 lead in the first period, New Jersey managed to take the lead in the second before adding an empty-net goal in the third to win it, 4-2. A close comeback win, right? Wrong. The true tale of Game 4 of this semifinal series is much more one-sided. As a matter of fact, the last time such a one-sided beating was handed out to someone from Philadelphia, it may have been this one. The Flyers were outworked and outmuscled as the Devils dominated from the start, forechecking and peppering beleaguered Flyers goaltender Ilya Bryzgalov with 32 shots in the first two periods. As the first period unfolded, there was a sense that the Flyer lead was only temporary and New Jersey would come storming back. They did, in spades. 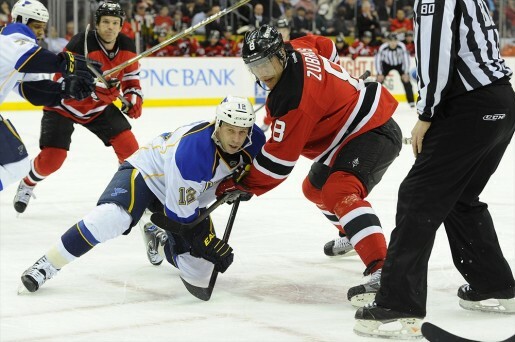 as Zubrus logged two goals and Zidlicky a goal and an assist. It was the type of timely play the Devils have been fortunate to get from somewhat unexpected places throughout the postseason. In their seven playoff wins, the game winning goal has been scored by seven different players. On the other side of the equation, frustration is mounting for the Flyers, who have all but admitted that they underestimated every aspect of New Jersey’s game coming into series. Center Claude Giroux echoed Briere’s sentiments. Giroux’s frustration showed during Game 4, when he was penalized for a hit to the head of Dainius Zubrus with 3.6 seconds remaining in the second period. A supplemental disciplinary hearing with the league is scheduled for Monday at 11 A.M.
“For me it looks textbook, like the hits they’re trying to get out of the game,” he said. The series will return to Philadelphia for Game 5 on Tuesday night, when the Devils will attempt to eliminate the Flyers and reach the Eastern Conference Finals for the first time in almost ten years.